SPRING FACULTY APPRECIATION LUNCHEON: Have you donated yet? It’s your last chance to support the Spring faculty appreciation luncheon on WEDNESDAY, JUNE 7th. Please click HERE for the Sign Up Genius. Thank you! 8th GRADE ACTIVITIES: As a reminder, click HERE for the letter from teachers regarding end-of-year activities for 8th graders. 6th GRADE FIELD TRIP: The 6th graders are going to the Museum of Natural History on TUESDAY, JUNE 6th. The permission slip and info can be found HERE. 8th GRADE FIELD TRIP: The 8th graders are going to Frog Bridge on THURSDAY, JUNE 8th. The permission slip and info can be found HERE. BATTLE OF THE CLASSES COLLECTIONS: Battle of the Classes collections are on-going this week. Canned and non-perishable food items can be brought to first period classes or placed in grade-level bags in the main office. Box Tops and pennies should be put in envelopes or bags with the grade noted and delivered to team leaders, the main office, or to Ms. O’Sullivan’s mailbox. Pennies can also be brought to the cafeteria during lunch period. Thanks! 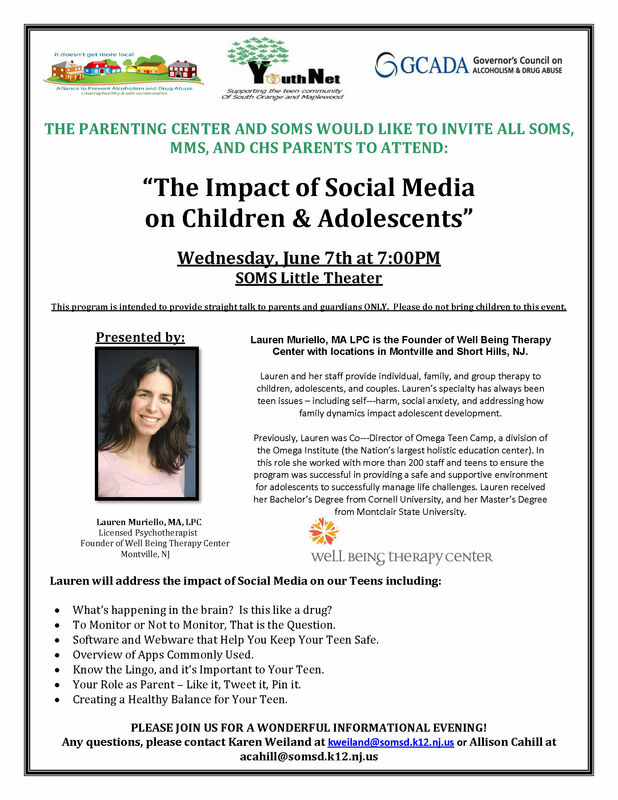 IMPACT OF SOCIAL MEDIA ON CHILDREN & ADOLESCENTS: On WEDNESDAY, JUNE 7th at 7pm in the SOMS Little Theater, Licensed Psychotherapist Lauren Muriello will speak on the impact of social media on teens. For more info please click HERE. MAPLEWOOD SOUTH ORANGE BOOK FESTIVAL: Bring the whole family to the Maplewood/South Orange Book Festival! FRIDAY, JUNE 9th at 8pm at SOPAC and SATURDAY, JUNE 10th from 10am-5pm at The Woodland and Burgdorff Center in Maplewood. Please click HERE for the flyer and all the info on these great events. ACHIEVE HONOR YOUR TEACHER AND STAFF TRIBUTE CAMPAIGN: The deadline for the Achieve Honor Your Teacher and Staff tribute campaign is FRIDAY, JUNE 9th. Check out the website http://achievefoundation.org/honor-your-teacher/ or click HERE for more info on this terrific program. MIDDLE SCHOOL FIELD HOCKEY CLINIC: The CHS Field Hockey team is holding a clinic for middle school students. No prior experience needed, just an interest in learning the game. Click HERE for more info on this fun opportunity.